Dorset Women's Week - do you want to be part of it? Dorset Women’s Week – do you want to be a part of it? 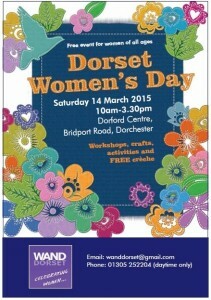 Every year WAND hold an event to celebrate International Women’s Day and this year it will be taking place on Saturday 14 March at the Dorford Centre in Dorchester from 10am – 3.30pm. The event is free to attend and will offer a range of activities and talks which will fit with WANDS 2015 theme – Empowering Women. In addition, this year we really would like to extend the scope of the event by working with partners to put on a range of different activities throughout the week leading up to this flagship event. We’re calling this Dorset Women’s Week (DWW). DWW is being launched on Friday 6 March with a debate between local council/parliamentary candidates about how they will be supporting women if they win their seat in the 2015 election. WAND would like to invite you to contribute to our programme by running an activity aimed at women as part of DWW at some point between 6 and 14 March. This could take the form of a special promotion aimed at women, a workshop or an activity. It could be something new but it is also an opportunity for you to advertise activities you might already be running for women. WAND will be collating all partner activities onto one programme which they will be widely disseminating and producing 5000 paper copies of (deadline for submission of information is Friday 30 Jan). We think this is an excellent opportunity for some joint working to really highlight local opportunities for women and we hope you will join us. If you would like to get involved in the Dorset Women’s Day event on the 14 March – perhaps running a stall or a short work shop – or you would just like to volunteer for us for a couple of hours then let us know. This entry was posted in Activity, Event, News and tagged Dorchester, Dorset, Women's Day on January 21, 2015 by mariac. Women’s Day is undoubtedly one of my favourite events of the year. I shall be there with bells on – thank you again for putting it together, I know it’s a huge undertaking but the attendees and the ladies who run workshops and do talks, love it just as much.